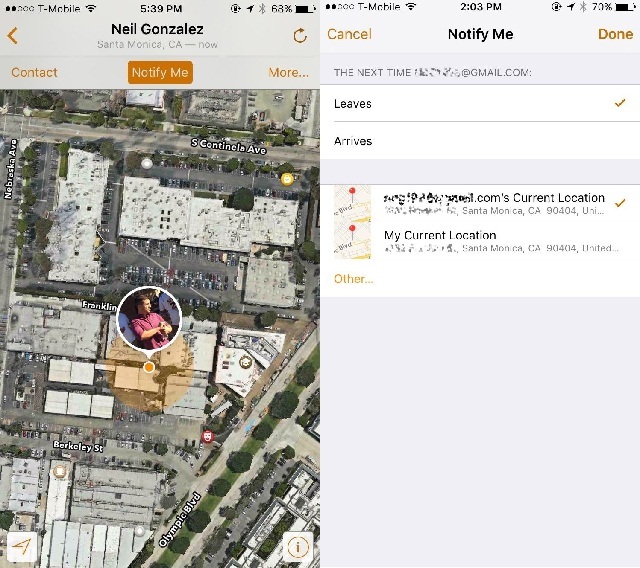 In an attempt to connect iPhone users with friends and family, Apple developed Find My Friends. It was released back in 2011 and has since been bundled with the iOS 9 operating system. The application has been proven to be useful in various situations, such as locating your teen when they are out or if you are checking what time a certain guest will arrive. In turn, your peers may keep tabs on you as well. But if you look at the other side of it, Find My Friends can be used to spy on other people. 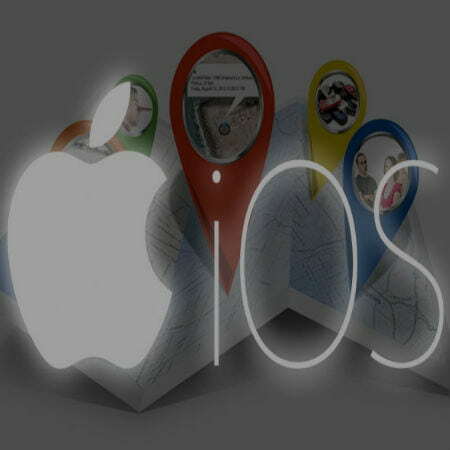 All it takes is a little knowledge on how to share an iPhone location without the other party knowing about it. Invading someone’s privacy is a serious matter, but seeing how easily this can be done through Find My Friends is quite alarming. The person who is being tracked will not have a sense that their every move is being monitored, neither will they receive an alert or notification for that matter. 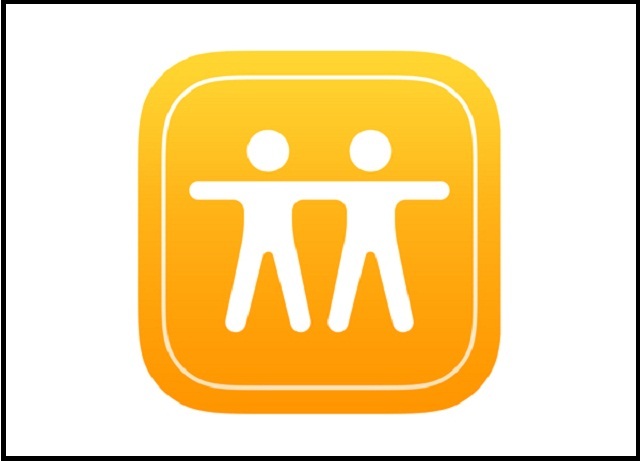 Not everyone is aware that Find My Friends in iOS 9 or lower even exists. If they do, they’ll view you as a follower and not as some freaky stalker of any kind. You can set this up in the iPhone of the individual you wish to track. Features include notifications when the time of departure and arrival from a certain area. The app has actually found itself in news headlines before, as a certain “ThomasMetz” had notoriously posted in an iOS forum on how he used Find My Friends to catch his wife cheating on him. An important thing to note here is that iOS 8 users don’t have the app by default. So you are going to have to download the Find My Friends app from the App Store. This goes for both you and your fiend’s phone. But if you both have updated to iOS 9, then this already comes in the software update bundle. Open the Find My Friends app on the iPhone. You might want to check on the “Extras” folder if you don’t see it in the main page. Enter the app and then tap on their contact photo at the bottom to enable Share My Location from the settings. Note: Make sure that the location is shared from This Device as other iOS devices such as the iPad could be connected to the same iCloud account. On the subject’s iPhone: Tap on add in the Find My Friends app. 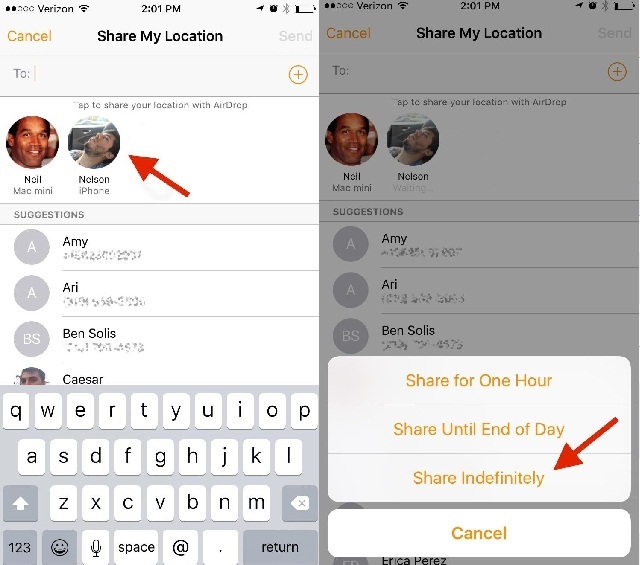 Hit your contact icon (assuming you are now connected via AirDrop) and select “Share Indefinitely” to share the phone’s location to yours for no time limit. 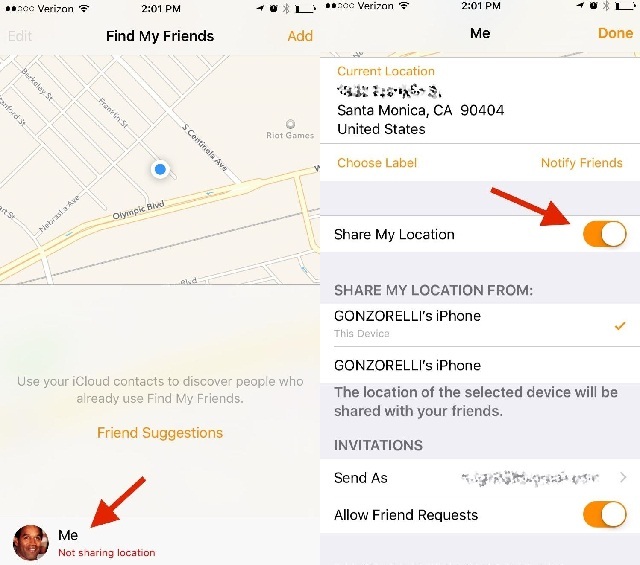 Find My Friends will alert your iPhone that your friend’s location is being shared to your device, so you should click accept for it to proceed. A second popup will then appear asking if you want to share your location with your friend. Click on Don’t Share, unless you want them tracking down your location as well. Congratulations! You can now track down your subject. You will receive notifications if they leave or arrive a certain location once you set it up through options. So your next worry is how long would it take for you to get caught. 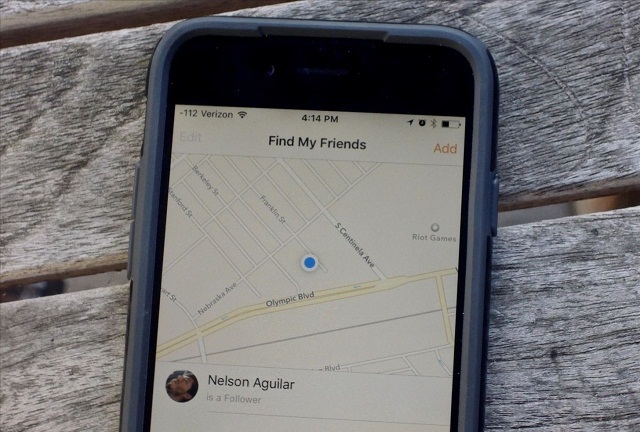 The chances of them discovering this are slim, as many users are not even aware of the Find My Friends app at all. So unless they are tech junkies or happen to come across this article, then you are safe. To make sure, you may always hide the app by making it disappear using the dock feature in iPhones. But do note that after restarting the phone, it will appear in the home screen again. The application may come useful if you are trying to track suspicious activity. But at the end of the day, it is still a complete invasion of privacy. So you might want to resort to more ethical methods and use this article as a way to check if someone is monitoring you without consent as well. GPS technology has continuously been improving over the years, and mobile phones have been the most commercially used device in tracking someone. But there are several disadvantages with tracking a location via a smartphone, including an increase in battery consumption and the probability of it being left behind. GPS tracking devices such as Trackimo enables users to track down their loved ones. They can monitor the device’s movements through a Web or mobile application. Overall, the GPS tracking system functions like Find My Friends but with more reliable features and an extended battery life.